Like so many women in our community, my reaction to the temple changes are all over the emotional map. I’m furious that they’ve asked us for silence. Shaking with rage over it. I am so furious about that request (that is obviously really a demand, because temple stuff) for how it robs me of any joy I might have experienced over the changes. First, how can I rejoice when we aren’t even supposed to acknowledge any changes? And second, this request demonstrates how blind they are, still, to the pain we have felt. Where is the ministry? There can be no ministry without discussion. It is illogical every which way round. I am furious, and I am wounded, deeply, over how much of myself I sacrificed, how my relationship with God was harmed, over something that could be so easily disappeared. There is a part of me that longs to rejoice, still. Because I know the women this will affect, and I want to weep with gratitude for how this will change them. And how this will change the church. Just think of the generations to come! Think of the girls who will grow up and go to the temple for their own mission service, not as an extension of their marriage. Then those girls with that experience will come in to ward councils and speak as if they have a right to. They will go to ward and stake temple nights and not participate in ceremonies that inflict spiritual violence on them. They will not be required to submit to inequitable covenants that teach far too many men that women are divinely ordered as submissive to them. Those girls will turn in to women who might have a chance at making their faith work. But once my thoughts turn to generations, like the good Mormon girl I am, they go backwards too. I think about women from the generation that raised me. Women who were told that birth control was a sin and a woman’s divine role was to provide tabernacles for God’s children. Those women who, dedicated to righteousness, sacrificed their health, their future, their opportunities, their bodies, to have as many children as God saw fit to send them. And then watched as women from my generation got birth control from their pediatrician before their wedding day. There are women from the generation above me who listened to the talk “To the Mothers in Zion,” heard the prophet say to “come home from the laundry,” and committed themselves to abandon careers and stay at home with their children, not because they felt called to it or enjoyed it, but because they wanted to be righteous. Even when it meant sacrificing deeply wished for dreams of education or career success or personal development or artistic creation. Even when it meant sacrificing their very sense of selves, personal security, and ability to rise out of poverty. Even when the consequences made a segment of mothers so miserable and toxic that a corresponding segment of my generation is paying the therapy bill. And then they watched as those daughters they sacrificed everything for got to experiment with pursuing aspirations. There are a LOT of my peers struggling through fraught relationships with their mothers. A LOT. It comes up in every feminist space, at every feminist gathering, it always winds up with an “Oh, moms,” and a shrug and a sigh. We don’t doubt their love, but we wish they understood us better, we wish they were more supportive, less critical, more aware of their actions, less hurtful. So we talk together about the lessons we’re unlearning and new parenting strategies we’re undertaking to try and create a less complicated relationship with our next generation. Sometimes, when friends know about my own complicated maternal history, I will get asked for mother/daughter relationship advice. I have to apologize and explain I have no idea how to work THROUGH a complicated relationship, I only know how to END one. (I wouldn’t recommend it unless you’re the situation where I would REALLY recommend it.) From that vantage point, I feel a little like an anthropologist in these discussions. I pay attention as other women offer solidarity and strategy, empathy and encouragement. I think the answer to that question is because they didn’t know how it hurt. Entirely. If you have a great big emotional wound, you can go through all the pain and horror of treatment, which requires changes you might not be willing or able to make, or you can callous over. You won’t have to look at it, but it won’t go away. You’ll just turn off your feelings. You won’t have the bad feelings, but you won’t have good feelings either. There’s only one feelings faucet, and the question is how hard do they have to close it off in order to maintain something they can be comfortable with? Mormon women wounded by misogyny in the church were left with no option to solve the problem. They each negotiated it as best they could with what tools they had at the time. For the Mormon mothers from the generation above me, I think many of them have had to make a whole lot of emotional sacrifices in order to live as they believed they *had to* in order to qualify as righteous. And I think that those of us who had one of these mothers understand what that cost meant in human lives. So as I contemplate this historic moment, I’m thinking of those women from the generation above me. The ones who reacted with rage at their daughter’s birth control. The ones who were chronically undermining their daughter’s professional pursuits, tut tutting at her work or educational aspirations. I understand them in a whole new way today. The church just changed one day for them too. All the sacrifices they made and the hurt they shoved down, the pain they shared only with the Heavenly Father they knew understood them, He the only one knowing what they bore. If you commit yourself to something at tremendous personal cost, you can’t give it up or that cost becomes meaningless. For that cost to matter, the something has to matter. Which is why these moms I’m talking about have to undermine or rage or whatever. They bet so large on the sacrifice being worth it, that they can’t afford to walk away. Their sacrifices need to matter, but they don’t. No one is revering these women for what they’ve done. Things just went how they always go, the church forgets in order to believe that doctrine is unchanging. They forget the change and they forget the women who paid for it. If these temple changes are my generation’s birth control, we need to take another lesson from that generation. We need to know that this isn’t enough. We need to stand up for our daughters and protect them the way we wished our mothers had protected us. We can own all our feelings, all the good and the bad, the rage and rejoicing, turn the feelings faucet all the way up, open up to healing with all its terrifying life altering implications, and we can say, this is not enough. We will protect our daughters the way we wish we had been protected. Thank you. This so perfectly articulates my struggles with my own mother, who loves me but cannot understand me, and whose life literally breaks my heart because she bet so big on the sacrifice and it has not paid off as she hoped. I’m fortunate because she’s not truly toxic, just terribly depressed. She will never be able to totally remove her “patriarchal blinders” because to do so would destroy her. I am not at a place where I can fully rejoice over these temple changes, good though I think they are (and also Not Enough). I know my mother will want them to Be Enough. In the meantime, I am working on accepting her love as enough and not unleashing my anger about the church at her. Beautifully written, so articulately heart breaking to think of the collective cost Mormon women, and the great loss. All those ruined dreams, for nothing it turns out. Not an apology, not a recognition of what this cost them, just a giant hand over all our mouths. The ceremonies won’t inflict *as much* violence. Until I’m everything is equal for men and women, many will still experience violence. And of course many in the LGBT+ will continue to experience the same or more violence as they always have. Thanks for sharing your articulate thoughts. I went to the temple yesterday and, as a divorced woman, was relieved to no longer be blessed to “hear the words of my husband.” The changes don’t undo the damage done, but it’s a start. Oh Tresa, thank you for putting words to my vague sense of disorder. I don’t cry anymore but this opened me up. My mother is advancing in Alzheimer’s, and my siblings and I are struggling with that. This helps my understanding, though it won’t make it easier. 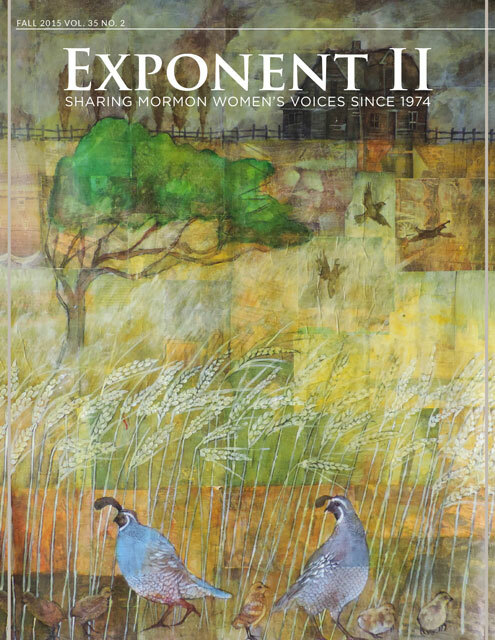 I commented on the last post things that apply here too— my gratitude to Exponent II for their willingness to discuss the changes, so that we don’t suffer the mental health ills in silence, as our mothers were required to do. I’m blindsided by the visceral reaction I feel to being silenced and erased all over again and I need a safe place that fosters discussion of these changes. I’m grateful for the part Ex2 has played in my ongoing struggle to find and develop my voice later in my life. I experienced institutional abuse but didn’t identify it because gaslighting, but once I saw it, I couldn’t gaslight myself anymore, and this is the same old nonsense. The pain is fresh and familiar at the same time, but this time I know More what to do— reject it and talk about it, and reading/hearing others doing the same helps so much. I’m grateful to have a familiar forum willing to help me improve my mental health from this latest assault. This resonates with me in so many ways and gives me so many things to think about in relation to my mother and my own daughters. No wonder she thinks I’m crazy. No wonder she sighs and says things like “I don’t know how you do it. I don’t know why you do it,” in relation to me pursuing a career while raising a whole herd of children. It also gives me so much hope for my daughters. Believe in the “and”. Career and children. Self and Family. Happy and at peace. I am so so grateful for my mother who worked full time and bore the disdain of our Utah neighbors; who bore the mortification of hearing across the pulpit on Mothers Day the sweet comments of the ward children about their angel mothers while her kids were thankful for their independence and Twinkies in the freezer; who was driven to excel in everything she did, even when it wasn’t something she loved; who pushed me out the door to do hard things backed by her love and encouragement; who told me 6 months ago that she hated going to the temple, and both of us found relief by admitting it out loud. And she taught her children about birth control at the kitchen table. Thank you for this. Thank you so very much. So important. I feel like my mom is jealous of the freedoms I give myself. And it breaks my heart that she doesn’t take them for herself. That no one showed her how. Devastated. My mom worked because she had to, and would have loved to be at home with the kids. So she was burdened from both sides: stereotyped at church as a “working mom” while finding no joy or fulfillment in her career. As such I had a somewhat schizophrenic childhood—she made me promise not to get married before finishing college, and always treated me as someone with intelligence and potential. But she also warned me frequently not to “give up” my children’s youngest years by going to work unnecessarily, and not to “let” my husband have a free ride on my wages the way my dad did on her. She believed on a level that women belonged in the home, and resented that my fathers unwillingness to earn meant she had to (he wasn’t much for providing childcare or housework either). Anyway, I’m grateful for her sacrifice on the altar of a job she hated so our family could eat and I could go to school. She boosted my feminism from a young age and saved me and my brother from poverty. But even she still won’t go quite as far with feminism as I have. Yes Tre. Yes to all this. Thanks so much for sharing this, Tresa. It’s so sad when changes in the Church blindside people who sacrificed so much for the old status quo, confident in what they had been taught that it would be eternal. Thank you for this, Tresa, for acknowledging the pain of previous generations of women. I was one of those women who desperately wanted to go to graduate school and have a career as well as be a mother, but my mothering years coincided with the Benson years and my husband’s bishop years, so I was obedient and stayed home, making life miserable for myself and for my children. It was all such a waste, and I have to be careful not to dwell on it too much or I am plunged back into that black pool of grief over what could have been. But even as I mourn the life I lost and can never retrieve, I rejoice in the women’s lives that are so much better, including those of my own daughters. Thank you for your wise words, for your understanding of the sacrifices of earlier generations of women, and for your willingness to forge new paths for future generations of women.